Fu is a jinchuriki for the Seven-Tails Beast, Chomei. Fu comes from the Village Hidden by Waterfall. She was later captured by Hidan and Kakuzu and the tail beast was extracted and sealed within the Demonic Statue of the Outer Path. She was than reincarnated using Edo Tensei and was sealed away. 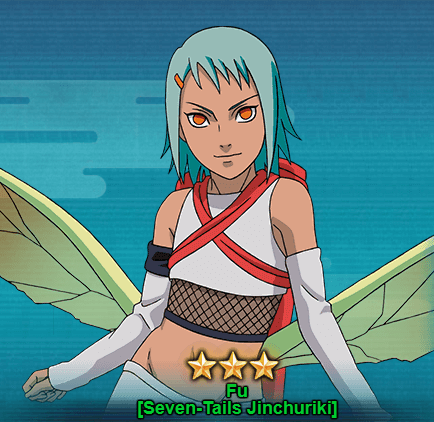 Let’s take a look at the abilities of Fu [Seven-Tails Jinchuriki] in Naruto Online Game. Ninjutsu Sleeping Powder [Prompt]: Causes damage to a selected unit and 2 of the opponent’s units, will also cause Sleeping. If the selected unit is already suffering from Sleeping, this attack will be effective to up to 7 of the opponent’s units in the field: will cause damage to those units and the units will suffer from Ignition. Ninjutsu Powder Release: Attacks one of the opponent’s units and causes Sleeping. Taijutsu Glorious Bounce: Chases and Attacks a High Floated unit, causes Knockdown. Ninjutsu Tailed Beast Chakra: Before the first action in a round, recovers a small amount of Life points based on this unit’s Ninjutsu attribute, will also recover 20 Chakra points. You can get Fu [Seven-Tails Jinchuriki] from the Jinchurikki Treasure 2 with 60-70 draws. Sometimes you can also find Fu in events especially One-Ingot Sales.